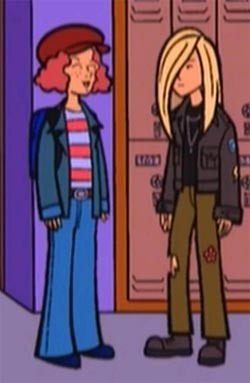 Kelly is a student in Daria's class at Lawndale High. Her name can be seen on Timothy O'Neill's seating chart in "Cafe Disaffecto". She's got frizzy ginger hair and freckles, and an alternative look. In "Cafe Disaffecto", the Melody Powers story got her so pumped up she got to her feet and punched the air. Has some interest in acting, auditioning for The Canterbury Tales in "Fair Enough". In "The Story of D", she hangs out with Burnout Girl (right), while in "Cafe Disaffecto" she pals around with Tania. She watched Tommy Sherman's most fateful game, alongside her classmates Josh and "Shaggy"... all of them looking the same age as they would in sophomore class, indicating animation errors time travel. This page was last edited on 29 May 2018, at 22:17.